Summary: Wallalong is a quiet, rural community that is very intent on staying that way. Signs with “Keep Wallalong Rural” are posted everywhere and it certainly feels like you’re a long way away from the city. The walk can be done on wheels but with no footpaths it means walking/cycling etc alongside the road which is narrow at times. Go to Morpeth, take a left across the river and then right onto Hinton road. Stay on this until after the river crossing, take first left up High Street towards Wallalong. 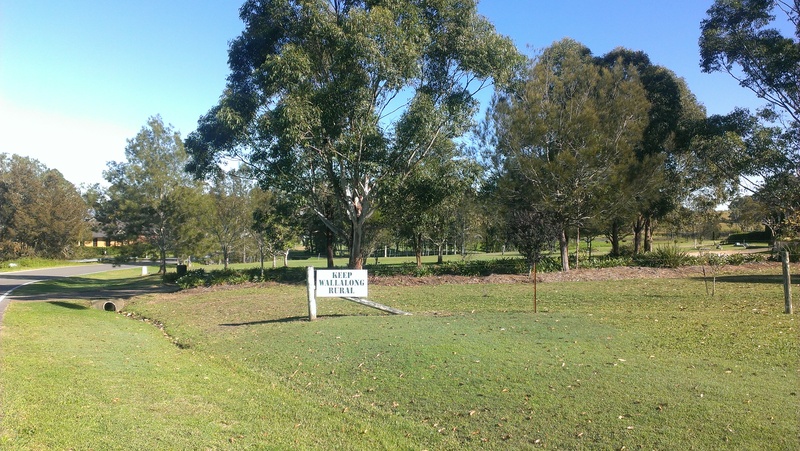 Go left at Morpeth road and park at Bowthorne Reserve. Walk back on Morpeth road and turn left up High Street. This takes you through the centre of Wallalong. Walk past the first right turn into Rosebank Drive and continue until you reach the second entrance. This is an 80km zone so walk carefully as there is not much room alongside the road, thankfully there is not much traffic. Go right and stay on Rosebank drive as it winds its way around the suburb. This is a lovely quiet neighbourhood and also home to the Phascogale. The Phascogale is a little-known native animal that belongs to a group of marsupials called the “dasyurids” which also includes better-known species like the Tasmanian devil and the quolls. It is a threatened species and therefore cats are completely prohibited and dogs must be kept under control at all times in this area. The Phascogale is a shy creature and only venture out at night so unfortunately you’re unlikely to see one.